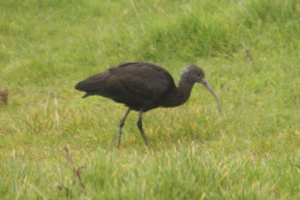 Observation - Melanic curlew - UK and Ireland. Description: A twitched bird. I've included a shot with a more familiar species (Wood Pigeon) to give an idea of scale. I've included a shot with a more familiar species (Wood Pigeon) to give an idea of scale.